The InCommN Newsletter began life as a simple email blast of invitations to Don’t Eat Lunch Alone and 21st Century Business Roundtables. It’s grown into something much more fun and useful. A selection of useful and/or interesting links to articles and posts from the Web. People tells us they think the newsletter is cool. Here’s the most recent issue—see for yourself. Adequate financing is frequently cited as the primary factor in success, while academia tends to believe that business degrees are essential. There are certainly many entrepreneurial cases to study in an effort to uncover what makes entrepreneurship work: according to the Kauffman Index of Entrepreneurial Activity 1996-2012, produced by the Kauffman Foundation — considered to be the world’s largest foundation dedicated to entrepreneurship — there were 514,000 new business owners each month in 2012. And if this seems extraordinary, consider that this is down from 2011 when some 543,000 new business owners created businesses each month. The decline is credited to an improved employment trend, which means that entrepreneurship is stimulated by, among other things, a lack of jobs. There are currently 12 million adults who own a business in the U.S. What drives this entrepreneurship and what drives success are increasingly important questions. In our 21st Century Business Round Table sessions this year, we’ve been spending time with a few old tools to help us be successful entrepreneurs. I’ve dusted off a few venerable but tried-and-true techniques, such as SWOT analyses, in the context of tracking how well a venture is doing in aligning its resources and actions to its mission and vision. It’s a classic approach that, re-fashioned a bit for the small business owner and solo-entrepreneur, brings heightened awareness about capacity and capability in relation to challenges and opportunities. That is, we’re using, and coming to appreciate, some powerful tools that contribute to mindfulness and to our own successes. A few additional pieces of information from the Kauffman Index report are particularly useful in our exploration. The highest rates historically occurred 2008-2011, during the peak of the most recent recession. The “decline” in 2012 is actually a return to the trend line. The fastest regional growth rates of entrepreneurship in the United States, as well as the highest rates since 1996, have occurred on the West Coast, with the East Coast close behind. The lowest growth rates, as well as the greatest declines, have been experienced in the Mid-West. The report I’m referencing, again, is the Kaufman Index of Entrepreneurial Activity 1996-2012. That time span allows some trend analysis, revealing that the rate of entrepreneurship has been higher for those aged over 45 than for those younger. In 1996, the gap between the entrepreneurship rate of those aged between 20 and 34 and those older was small; the gap has increased significantly since, as older entrepreneurs are starting businesses at much higher rate than younger. About 340 adults out of 100,000 aged over 34 are starting new businesses each month, whereas about 230 adults out of 100,000 aged under 35 are starting new businesses. In 1996, almost 35% of new entrepreneurs were aged 20 to 34, and a little over 14% were aged over 55. In 2012, 26% were aged 20 to 34 and 23.4% were over age 55. If this age shift seems counter-intuitive, ponder the education shift. This one surprised me: since 1996, the entrepreneurship rate for those without a high-school diploma has always been higher than for those with a college degree, except in 2001, when the two groups had the same rates of business creation. Since 2001, the trend for those with less education has gone up to the point where it almost doubles the rate of highly educated. But this turns out to be more of a demographic shift than an educational variation: the rate of participation in entrepreneurship has increased dramatically for immigrant, Latino, and African-American populations who have not obtained higher degrees and who have become unemployed during the recession years. Among native-born Anglo/white population groups, people with higher degrees are far more likely to become entrepreneurs than those with less education. Entrepreneurship attracts those confronting an economic or employment disadvantage, regardless of education; as well as older and more educated professionals. Seen this way, entrepreneurship is a choice made to create jobs, incomes, and life-styles for the entrepreneurs while being “free” from the difficulties of working for, or becoming unemployed from, other employers. Entrepreneurship is an opportunity and sometimes a necessity. We spend time on SWOT analysis because it forces us to pay attention to all these factors. At the heart of this tool is the very first demand: self-knowledge. Once I can clearly articulate my vision, and develop a mission that will fulfill it, I have to gather resources, make decisions and take actions that will move my mission forward. And to fully understand how I will do that, I want to commit serious thought to understanding my capabilities, capacities, opportunities and challenges. I love this process: I turn to it often, and it always brings new insights and discoveries that me drive forward. Of the roughly half-million entrepreneurs entering the market places this month, some are old, some young, some with advanced degrees and some not, speaking many languages and born in many countries. They all share this same drive: to use their capacities to create enterprises. To be successful, they will need to be purposeful, intentional, and mindful. The News From InCommN comes out every Friday afternoon. You can use it to check out business events happening all over Western Massachusetts the following week from the InCommN Business Calendar. They’re all conveniently put together for you in the newsletter. Then we choose a few articles that we found interesting or useful from around the web each week. We range widely through economics, business, tips, and technology; and we throw stuff in sometimes just for fun. 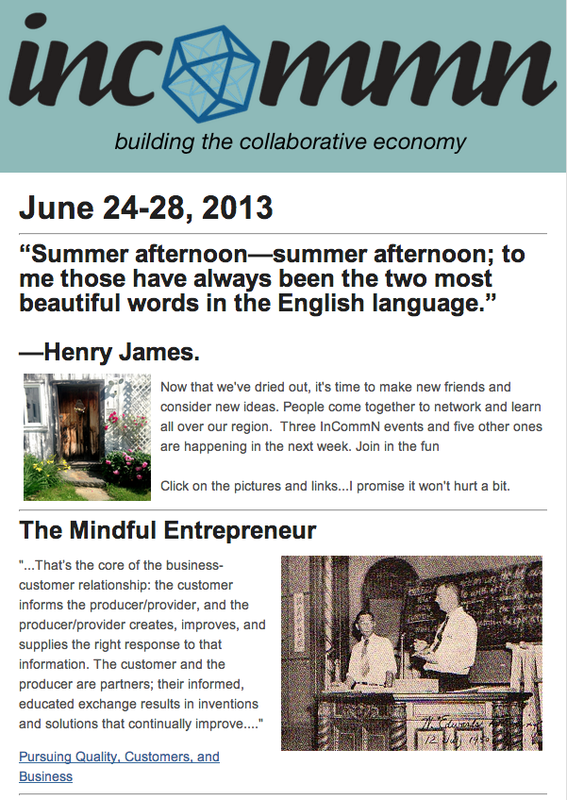 We try to get away from the boring, cookie-cutter look and content that most business newsletters have. People tell us they enjoy our selection of thought-provoking quotations, and find the images fun to look at.